BAM’s Peter Jay Sharp building was filled with a diverse crowd on Thursday, December 3rd for the screening of Leticia Tonos Paniagua’s Cristo Rey. 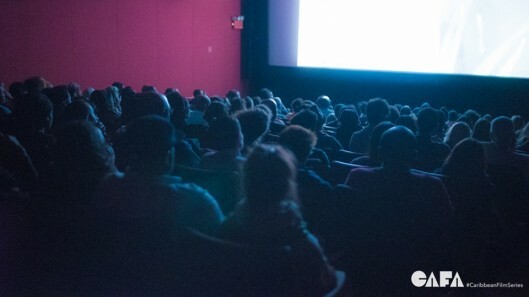 Co-Presented by the Caribbean Film Academy and BAMcinematek, the main feature was preceded by a poignant short film, Pugatorio, by Haitian director Martine Jean. Beautifully shot with deep vibrant colors and contrasts, the 12-minute movie revolves around Rosa Jean Louis and her daughter Soledad as they are questioned in a Dominican immigration office about their nationality and the authenticity of their papers despite being born in Dajabon. After being humiliated and degraded based on her Haitian sounding name and separated from her daughter, the film ends with her deportation and her crossing the border towards Haiti, a state that she knows nothing of. While the latter film presents this almost inhumane facet of deportation in the strained Haitian-Dominican relations, Cristo Rey approaches this delicate subject in a different way. Taking place in the slum of Cristo Rey, the story begins with Janvier, a first generation Haitian-Dominican (his mother is Haitian and father Dominican). The town is stricken by poverty, as well as an intense divide between Haitian immigrants and Dominicans, and is ruled by the drug lord El Baca. The feature really explores and examines various aspects of what tarnishes the relationship between the people of Hispaniola: racism, prejudice, poverty, and most importantly misunderstanding. The screening was followed by a discussion led by filmmaker Michèle Stephenson and Cristo Rey’s Director Leticia Tonos Paniagua. The most common comment was on the authenticity of the depections and Paniagua’s beautiful eye. HCX thanks all of those that came out to the screening! Special thanks to CAFA, and BAMCinématek. Cut, print! That’s a wrap! 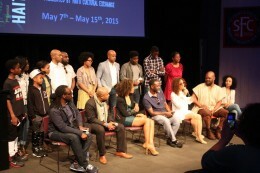 The third biennial Haiti Film Fest came to a close on May 17, 2015! Take a look below for a recap of the 2015 festival. Click here to view the full film fest schedule. 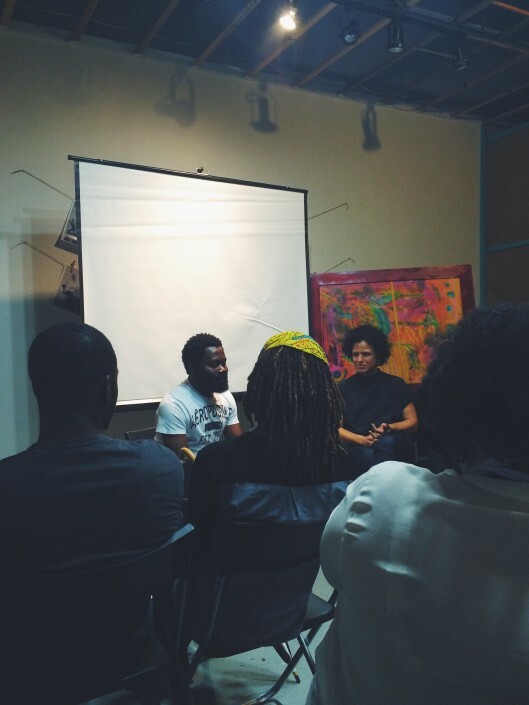 Extending the Film Fest from a long weekend to seven days, the third biennial Haiti Film Fest was full of interesting topics. Screening over 15 films by filmmakers from Haiti, Cuba, the United States and Europe, the festival drew over 1,000 attendees who came to show their support and engage in conversations on pertinent issues affecting the lives of Haitians, both at home and in the Diaspora. Films covered a wide range of topics including the environment, grief, dictatorial regimes, spiritual movements, love, thwarted coups, class and identity, and even Haitian martial arts! Joined by filmmakers, cinephiles, scholars and the overall New York Community, the conversation continued beyond the screening room and into the homes and communities of participants. 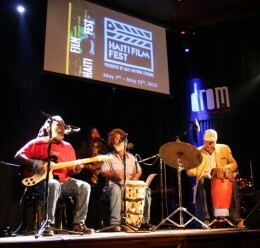 Kicking things off on Thursday, May 7th for the Opening Night of Haiti Film Fest, we returned to DROM NYC for a night of fun, dancing, live music and support. Our VIP guests were treated to an exclusive pre-reception where they received a complementary Haiti Film Fest tote and were invited to sample a mix of hors d’oeuvres while they mingled with fellow members and VIP guests. Doors opened to the general public at 8pm as attendees continued to mingle and take pictures with friends, filmmakers and celebrities. Haiti Film Fest Advisory Committee Member Michèle Stephenson hit the stage welcoming distinguished guests and thanking everyone for taking the time to support Haiti Cultural Exchange. Haiti-based radio personality, Carel Pedre, served as our host and MC for the evening. Carel spoke on the importance of the festival and of story telling through the medium of film. Screening two short films, Freedom by Matthew Brown and La Veuve by Wood-Jerry Gabriel of the Cine Institute, guests were given a glimpse of the screenings to come. Sanba Zao kicked off the musical portion of the evening with live drumming bringing everyone a taste of authentic Haitian rasin music. Following Sanba Zao was NYC’s newest underground rap artist Ioan Delice. Debuting his new song Petit Pays dedicated to Haiti, he rapped over a mixture of traditional Haitian sounds and Hip Hop beats, an instant favorite with the crowd. Ending the night with DJ Hard Hittin’ Harry’s new world sound, Opening Night was a fun-filled way to kickoff this year’s Film Fest. 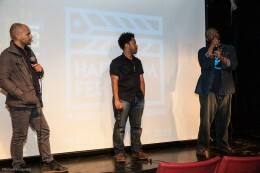 Friday, May 8th was the first day of the Film Fest and we screened Ayiti Toma by Joseph Hillel. Held at the City College of New York, the director joined us for a post film Q&A moderated by prolific literary author, Edwidge Danticat. 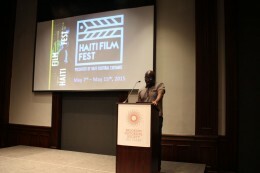 A heated point of discussion, for instance, came as guests questioned the director’s choice to include non-Haitians as representative of the Haitian narrative. •I learned that Haiti became the first black republic, gaining independence on January 1st, 1804. •I enjoyed the film and learned valuable information about the independence of Haiti. 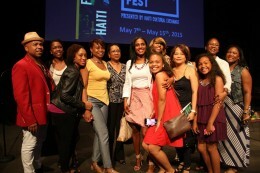 •The Haiti Film Fest is an eye opener. 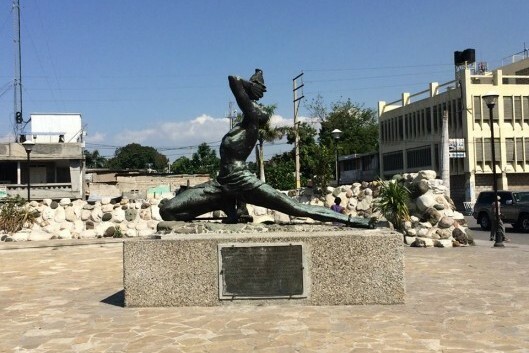 To see the history behind Haiti, it’s worth it! •George Corvington was very enthusiastic about his history. It was really colorful. •Today as I was watching the film, I enjoyed learning about Haiti’s Culture and battle to freedom. 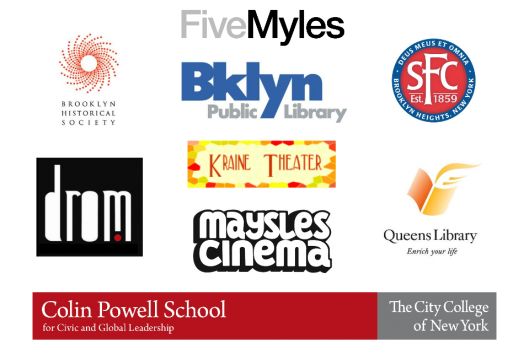 On Sunday, May 10th we returned to St. Francis College for a special Mother’s Day screening of Forever Yours by Patrick Ulysse, Donoma by Djinn Carrénard, and La Belle Vie: The Good Life by Rachelle Salnave, and two shorts; one from the Global Empowerment Movement and Sweet Tea by Natalie Paul. Ulysse, the director of Forever Yours, joined us for our first post-film discussion, moderated by Film Fest Advisory Committee Member, Curtis John. Ulysse displayed humility noting that the film was a community project. Audience members got a chance to experience that sense of community when the entire film cast, from sound production, to makeup and editing, were invited on stage. 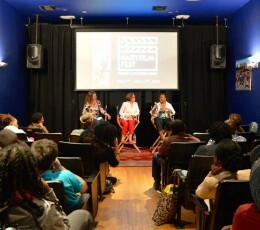 The Donoma Q&A was moderated by Haiti Film Fest Advisory Committee Member, Michèle Stephenson. Debuted in 2012, director Carrénard made this movie with a budget of 150 euros. Another community based film, Carrénard had friends and family contribute to this project which explored the complexities of human relationships. Following the Carrénard Q&A, guests were invited to a special Mother’s Day reception held before our final screening, the highly anticipated New York Premiere of La Belle Vie: The Good Life. A post-film discussion with director Rachelle Salnave was moderated by media professional, Daphne Leroy. The audience was mesmerized with Salnave’s ability to aesthetically convey her eagerness to discover “the good life” she so often heard her parents speak of during her childhood. Many were impressed with the director’s cinematic ability to portray beauty in a country where mainstream media and films have only focused on devastation and calamity. On Monday, May 11th we had an Evening of Shorts at the Kraine Theatre in the Lower East Side. Screening three shorts from Ciné Institute, Haiti’s only free school for film, as well as Freedom, a short by Matthew Brown, and Papa Machete a short by Jonathan David Kane. Moderated by Christian Ugbode of the National Black Programming Consortium (NBPC), we were joined by the Director of Ciné Institute David Belle and Jason Fitzroy Jeffers, producer of Papa Machete for our post-film discussion. Questions ranged in specificity to each film, but the overall arching theme of the night was the relationship between the film industry and Haiti, and what it means for Haiti’s future. The short films presented on this day showed the importance of diversity within media and platforms that allow multiple opportunities for emerging artist to share their stories. The landmark Brooklyn Historical Society was the perfect venue for our screening of the classic, Haitian Corner on Tuesday, May 12th. Directed by the critically acclaimed Raoul Peck, Haitian Corner was Peck’s first feature length film. Surrounded by historical artifacts and the vibrant history that made Brooklyn, Haitian Corner was a flashback to life in the 80’s. 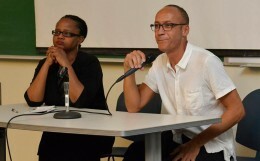 Moderated by NYU Professor Millery Polyné, we held an open forum after the screening. Conversations revolved around major themes, placing the film in historical context, unpacking the use of key phrases used in the film, and the artistic sensibilities of the director. 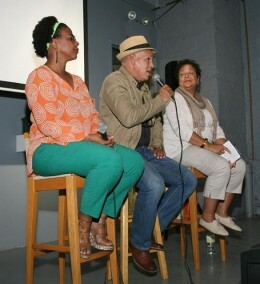 On Wednesday, May 13th we screened Reembarque/Reshipment by Gloria Rolando at Maysles Cinema in Harlem. This thoughtful documentary explored the history of Haitian migrant workers who arrived en masse to Cuba and the social and political complication that occurred as a result. During our panel discussion with Carolle Charles, Pam Sporn and Catherine Murphy, audience members expressed intense interest in delving further into the historical connections between Haiti and Cuba, the role of the Cuban government in the disenfranchisement of the Haitian people, and the complexities of cultural identity. 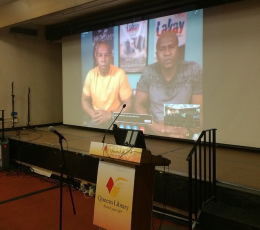 On Thursday, May 14th we reached out to our fellow Haitians in Jamaica, Queens screening Lakay by Tirf Alexius and Remoh Romeo at the Central Library: Queens Library. Theirs is a story of return to a forgotten homeland, a journey to rediscover their Haitian roots and reconnect with family in the aftermath of 2010 the earthquake. As Alexius and Romeo joined our post-discussion via Skype, it was clear that the film had touched a nerve. The audience was moved by their touching story. Some expressed frustration and even anger at the rate of progress and development within Haiti. But mostly, the audience was elated that there was finally a dialogue among disconnected family members. 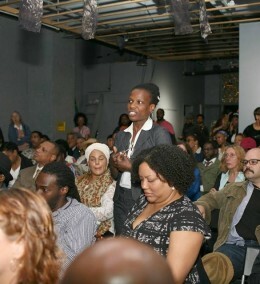 The Film Fest went out with a bang as we returned to our home base, FiveMyles Gallery on Friday, May 15th. We screened Storming Papa Doc by Mario Delatour to a packed house. In addition to narrative interviews, Delatour’s documentary brilliantly incorporates animation to re-enact accounts of the historic siege of Haiti’s Casernes Dessalines on July 28th 1958. The director joined Film Fest Advisory Committee Members Michelle Materre and Leslie Fields-Cruz of NBPC for an engaging conversation. Audience members expressed their appreciation for the film and its importance in archiving and recording such a significant chapter in the country’s history. They wondered how Delatour came to be granted access to these government officials, and how he was able to get such candid disclosure regarding the events of that infamous evening. It was a fitting way to end the festival and we were pleased to have Mario join us from Haiti to be part of the Q & A. 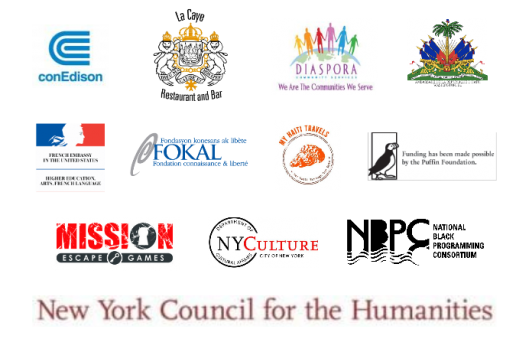 We extend special thanks to all of YOU for attending the festival; and our sincere gratitude to the Haiti Film Fest Advisory Committee, volunteers, venue & outreach partners, sponsors, moderators and filmmakers for their support. 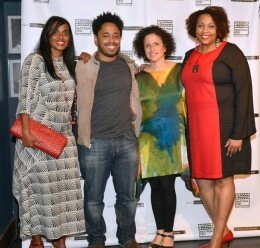 Click here to take a look at pictures from the Haiti Film Fest Opening Night Reception! Click here to take a look at pictures throughout the festival! 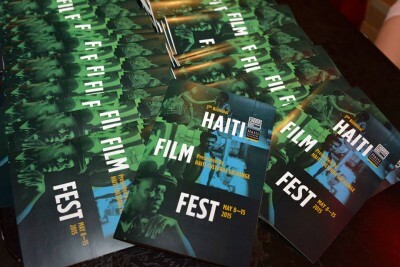 The third biennial Haiti Film Fest took place from May 7-15th, 2015.